Bitter sweet – Historic Ruling to Cut Weekend Pay Penalties Welcomed By Small Businesses. Sunday and public holiday penalty rates will be reduced for full-time and part-time workers in the hospitality, retail and fast-food industries, the Fair Work Commission has ruled. This is one of the biggest changes for penalty rates this century and will lead to big cost saving opportunity for many small businesses who simply can’t afford to open on Sundays and Public Holidays under the current ruling. There are not firm dates for implementation of this ruling, which will be a complex process for many businesses to implement, plus Labour are campaigning to have the decision overruled. We will keep you informed of information and it’s potential impact upon you the business owner as new information is released. Below we have outlined the changes. As much as this news is great news for business owners, the Australian Council of Trade Unions (ACTU) said nearly half a million people, including some of the country’s lowest-paid workers, would lose up to $6,000 a year. These are people who just earn enough to cover weekly expenses. It is there for recognised that the immediate implementation of the variations to Sunday penalty rates would inevitably cause some hardship to the employees affected, particularly those who work on Sundays, so appropriate transitional arrangements are necessary to mitigate the hardship. 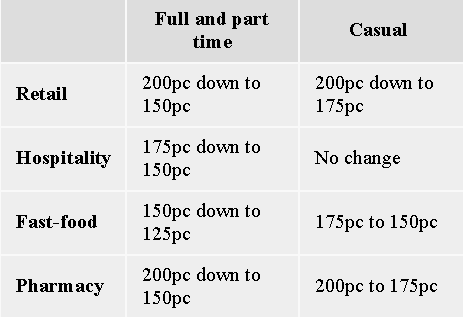 Casual workers in the retail and fast-food industries will also see their pay cut but rates for casuals in hospitality will remain the same. The public holiday penalty cuts will come into effect on 1 July 2017. The Fair Work Commission has not yet decided when the Sunday rate cuts should come into effect, but indicated it should be within a year. If you would like to discuss how this will impact your business financial or how you can manage this process from an HR perspective speak to the Team at Omnis Group. Our specialist Business Accountants can assist you assess the financial impact of the ruling, whilst our HR team can help you understand the impact upon your staff, your responsibilities and how you can manage the transition positively. ← Successful businesses rely on data not gut feel to make decisions!